The 2017 Honda CRF250L/A will hit Australian showrooms in March, and will be available with ABS for $6,399 or without ABS for $6,099. 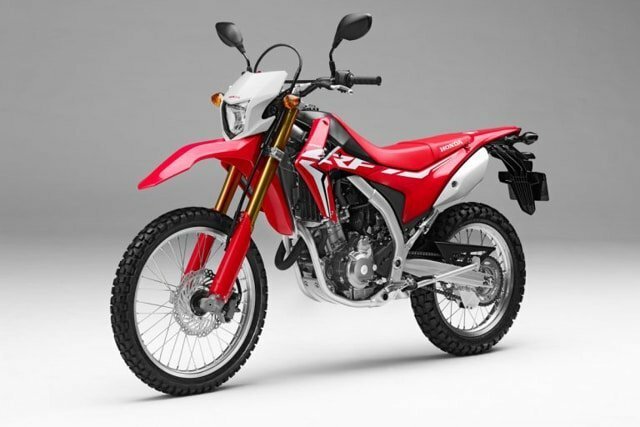 The dual-purpose Honda CRF250L/A is designed to be a lightweight, manoeuvrable machine that can easily handle congested city streets with superb controllability; while its suspension, ground clearance and seat height (875mm with wet weight of 146kg) deliver a fun and comfortable ride on rough roads and trails. For 2017, the CRF250L/A has an increased power output thanks to a revised fuel injection system and throttle body configuration, new airbox and lightweight exhaust system. The ABS model is fitted with two-channel, switchable ABS, giving the option to disengage the rear brake if you feel the need. The bike is fitted with aluminium rims (21-inch front, 18-inch rear) with block pattern tyres as standard. Being a small capacity all-rounder, it is fitted with a new cohesively laid out compact digital dash which features a speedometer, tachometer plus fuel gauge and clock. Much more compact than the previous design, the rear light, indicators and numberplate bracket are neatly out of harm’s way. A small but useful detail for the off-road explorers is that the gear lever now features a folding tip. The 2017 Honda CRF250L/A also has new body work inspired by the CRF450R. The 2017 CRF250L/A with improved power, appearance and usefulness, is a great place to start your motorcycling adventure and opens a whole new range of two-wheeled opportunities to riders whatever their experience level. The post 2017 Honda CRF250L/A In Australian Dealerships In March appeared first on Motorcycle Life.